On the trip from Tucson, we sat next to a nice little old lady named Fay who was also on her way to Nashville. She said I looked like Bruce Willis. Her granddaughters' husband is a songwriter, wrote Shotgun Rider for Tim McGraw. Once we landed in Nashville, it was off to the CMA office to pick up our tickets and stuff. Our tickets are on the 4th row! We were supposed to hear new music from Billy Currington but the masters weren't ready so we just hung out him and his people. 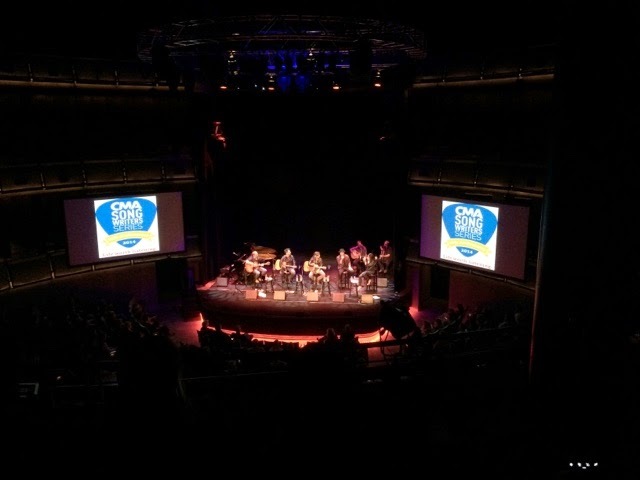 Then to the CMA Songwriter Series at the Country Music Hall of Fame. Brett James, Marcus Hummon, Chris DeStefano, Sara Evans and special guest Gavin DeGraw all sang songs they'd written and told the stories behind the songs. Here's a pic of the Songwriters Series. Very cool event.